In the Clover Kingdom, in the village of Hage, there was a young boy named Asta, who, along with his friend, Yuno, was once found abandoned. Asta dreamed of one day being the “Wizard King,” the greatest mage in the land. He has one big problem; he can't use magic. When he was 15-years-old, Asta received the rare “five-leaf-clover grimoire” (a book of magic), which gave him the power of anti-magic. Can Asta become the Wizard King without being able to use magic? He won't give up, nor will his talented friend, Yuno. THE LOWDOWN: The Black Clover manga reminds me of the Harry Potter series, but this is not the first time that I have found shonen jump magical fantasy that recalls the magical world of Harry Potter for me. Besides, Black Clover is just fine on its own. Black Clover Volume 4 is the best volume yet in a rapidly improving series. What creator Yuki Tabata offers is already quite strong, and it promises to get stronger. Like Blue Exorcist, Black Clover is a magical school manga full of mystery and awesome displays of magic. Let Black Clover be the four-leaf clover on your manga-reading list, with its excellent characters and superb magical mystery. 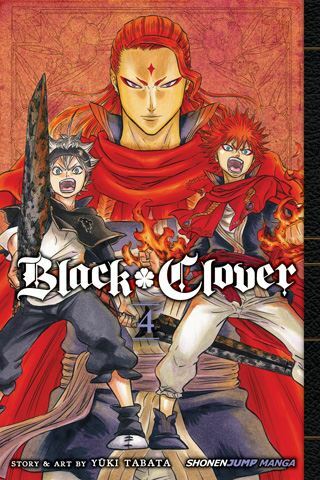 I READS YOU RECOMMENDS: Fans of everything from Naruto to Harry Potter will definitely want to open up the spell book that is Shonen Jump title, Black Clover.